The four star function room at the new Westhoughton Cricket Cricket club has state of the art catering facilities on-site. Our professionally run kitchen provides delicious, tasty food that includes hot buffets or function buffets and function meals plus we have an extensive wine list. Catering for parties such as a wedding reception, christening, sportsman's dinner, birthday party or any function you care to mention. Our varied menus cater for a range of budgets and includes classic traditional favourites and mouth watering buffet selections that are sure to impress your guests. Our aim is to make your function or party a great success so we can tailor our menu to your own tastes if required. Just call us on 01942 504 075, we are always happy to help. 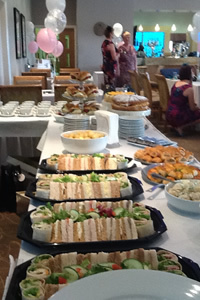 The tastefully designed function room can accommodate a party of up to 100 guests for buffets or three course meals. The members room if required, can also seat a further 45 people. Alternatively you can make a booking enquiry online.